James Beard award-winning chef and restaurant tycoon Mario Batali discusses his cooking roots, the unexpected regional cuisines he loves, and how he grew one eatery into a 26-restaurant empire. 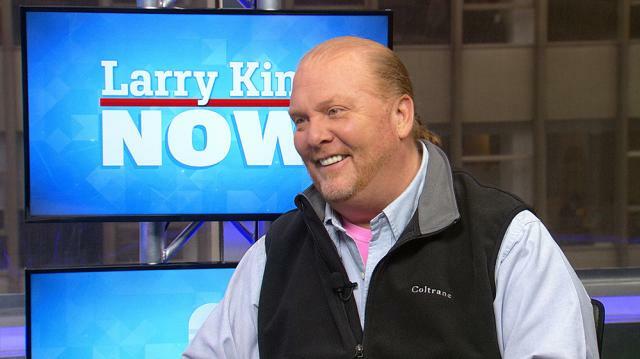 Larry talks to Mario Batali, an acclaimed chef, owner of more than 25 restaurants, Emmy Award-winning television personality, James Beard Award winner, and best-selling author. Batali’s latest restaurant is La Sirena in New York, and his latest book is ‘Big American Cookbook: 250 Favorite Recipes from Across the USA.’ What makes a famous chef, Larry asks? Batali believes it’s about moving to a big city, proving yourself through food, maintaining authenticity, and talking about it a little. He first worked at a stromboli shop in New Jersey, then for the Four Seasons Hotel in San Francisco and Santa Barbara, before moving to Italy and making everything by hand in a trattoria. At the Four Seasons, he realized he wanted cooking to be his career, though in 1979, being a cook was a step before going to jail. Larry asks what elevated Batali to fame. Batali believes it was his Food Network show ‘Molto Mario,’ where he became a voice on Italian cooking. What he likes about cooking, he answers Larry, is the act of making stuff and achieving immediate gratification via empty plates, though all his best work becomes poop the next day. Batali says restaurants are constantly judged, making consistency the most important and hardest thing to love. Larry asks how important critics are, and Batali believes they contribute to greater understanding, and the internet has increased their ranks. From cooking food, Larry shifts his questions to writing about food. He asks about Batali’s newest cookbook, which focuses on American food Batali discovered during his travels. The book seeks to capture local dishes, the soil and soul of a place. Batali talks about the legacy of the late Gina DePalma, a Babbo pastry chef whom the book is dedicated to. The conversation goes back to cooking, when Larry asks how Batali can be so hands-on at his restaurants. Batali replies the best way to empower people is to work with them, and that he opened more restaurants as defensive moves to keep the people he had trained so well. Larry asks about a restaurant Batali is in the process of opening in Los Angeles, Eataly. Batali describes it as a grocery store with local foods and different restaurants. Finally, the seasoned chef dishes out tips. Larry asks if he recommends culinary school to aspiring cooks, and Batali says it’s only good if you’ll be a top student, otherwise, working at a restaurant will give you experience. This act of teaching, he says, falls short in the kitchens of some screaming chefs on TV, who shout because they realize they haven’t trained their staff well about things like variation.